Most Americans outside the "coffee milk belt" mistakenly confuse a "Bass Boat" with those logo-sticker-encrusted, disco-glitter-bedazzled plastic speedboats best known from basic cable fishing shows. 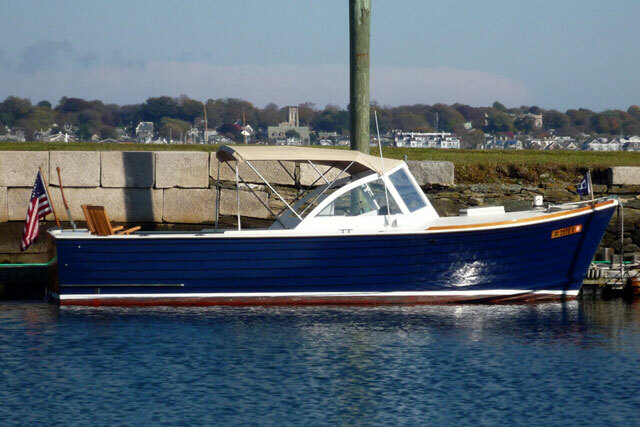 In Non-Rhotic American English the word "Bass" refers to the Striper (Roccus Saxatilis) and a "Bass Boat" is a rugged, deep water inboard like the beautiful MacKenzie Cuttyhunk pictured above. Designed for the steep chop and swift currents of the Northeastern coast of the U.S., these chunky, no-nonsense boats are the precursors of the now ubiquitous deep-vee center console fishing boats. Like the Striper, these boats were seemingly everywhere at one point and then very nearly vanished completely in the 70's and 80's. Thankfully, both are enjoying somewhat of a resurgence now and several new companies have started making updated versions of this venerable design, both in fiberglass and wood. It's easy to see why, In addition to the rugged, good looks of the Bass Boat, the design is much more flexible, economical and family friendly than the center console.